Here’s what’s up in the world of TV for Sunday, June 24. All times are Eastern. The Newsroom (HBO, 10 p.m.): Aaron Sorkin is one of the strongest screenwriting voices of his generation—but strength doesn’t always imply subtlety, as early reviews of Sorkin’s latest TV effort, The Newsroom, implies. Yes, this is pure, uncut Sorkin, idealistic and witty in ways which, depending on your opinion of the man, come off like either catnip or rat poison. 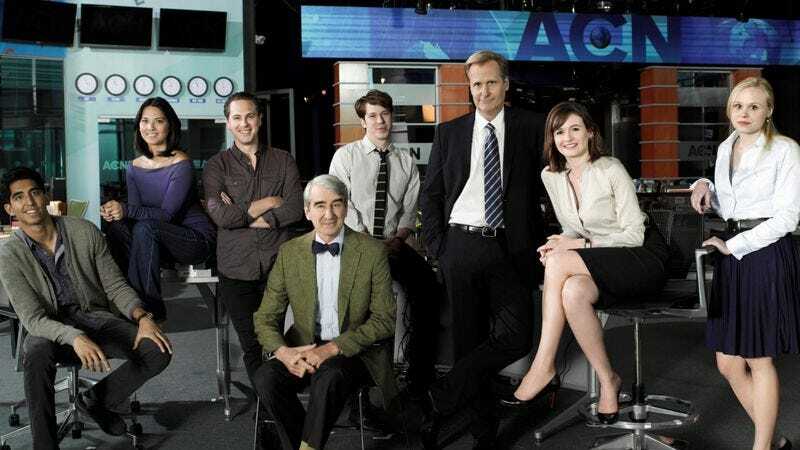 Scott Tobias has seen the pilot and weighed in, but tonight’s your chance to chime along in the comment section—an essential component of 2010s media that Sorkin, in all likelihood, detests. Ultimate Spider-Man (Disney XD, 11 a.m.): Previously seen temporarily transforming Harry Osborne into New York’s premier superhero, the Venom symbiote rears its toothy, snarling maw once more. One thing David Sims has always wondered: What’s Venom’s oral-hygiene routine? Rev. (Hulu, 5:30 p.m.): Conveniently dovetailing with the première of The Newsroom, Rev. goes in front of the cameras and displays that transplanting a vicar from rural England to London may lead to that vicar saying things he can’t take back on television. After being burned by too many loud-mouthed vicars, Todd VanDerWerff has learned that lesson the hard way. True Blood (HBO, 9 p.m.): Now that there’s no longer a Rosie Larsen to not care about in this time slot, the latest thread of Southern vampire mystery wants you to transfer those feelings to Sookie’s attempt at hiding the truth of Debbie Pelt’s whereabouts. Carrie Raisler was not in Bon Temps last Halloween and therefore has no testimony to give. Falling Skies (TNT, 9 p.m.): A number of you turned up for the return of TNT’s big post-alien-invasion actioner, which is good—because if Les Chappell’s ever going to defeat those damn skitters, he’ll need a lot of backup. Onward to victory—and the second season’s second episode. Longmire (A&E, 10 p.m.): If A&E really wanted to play to the older audience that’s taking to Longmire, it’d tap into nostalgia for classic Westerns by ditching its dirt-caked, single-guitar-strum theme song and open every episode with a twangy holler of “Loooooooooongmiiiiiiiiiiiiiiiiiire!,” followed by the sound of a gunshot—which is what we hear in our head each time we we read the title of the show. Zack Handlen’s the one holding the gun. Metalocalypse (Cartoon Network, midnight): You can practically hear Brendon Small and Tommy Blacha giggling with juvenile glee at the title of this week’s Metalocalypse: “Going DownKlok.” Because it’s about a submarine, see? And the Dethklok guys are going bonkers without any women around… this is not a joke that requires Phil Dyess-Nugent to chart it out. Doctor Who (Classic) (11 p.m.): “The Ribos Operation” marks several milestones for Doctor Who: Producer Graham Williams’ first attempt at establishing a season-long arc, the beginning of that arc (a.k.a. “The Key Of Time”), and the introduction of Mary Tamm as Time Lady Romana. Won’t you be the Romana to Christopher Bahn’s Fourth Doctor as he slams through the four parts of this Doctor Who serial? South Park (Classic) (1 p.m.): Outside of Halloween airings of Michael Jackson’s “Thriller,” zombies were an uncommon sight on television during the more innocent, less-flesh-eating days of 1997. So you can imagine the excitement that surrounded South Park’s first All Hallow’s Eve episode, where a pinkeye epidemic mutates into an outbreak of the undead. Or Phil Dyess-Nugent can imagine it, since that’s a minor aspect of his job. The Simpsons (Classic) (3 p.m.): One word, repeated multiple times in a jaunty manner: Monorail. There’s nothing on earth like a genuine, bona fide, electrified Nathan Rabin review of “Marge Vs. The Monorail.” What’d we say? Monorail. Monorail. Monorail. TV Land Presents The AFI Live Achievement Award 2012: Shirley MacLaine (TV Land, 9:00 p.m.): The American Film Institute—not the other AFI, the goth-flecked punk act responsible for “Miss Murder”—honors the star of The Apartment, Terms Of Endearment, and dozens of allusions to Out On A Limb that flew over our heads as Tiny Toon-loving youngsters. The Great Escape (TNT, 10 p.m.):This inversion of The Amazing Race—you have to get out of the destination, not to it—has us thinking other reality shows could freshen up stale premises with a little reversal. What about a version of Dancing With The Stars where the D-list teaches the professional dancers? A Keeping Up With The Kardashians variation whose purpose is completely ignoring Kris Jenner and crew? A Survivor spinoff where contestants compete to be the first to die? Scott Von Doviak is currently accepting further ideas. Aqua Something You Know Whatever (Cartoon Network, 11:59 p.m.): For characters who were introduced in a particularly batty episode of Space Ghost Coast To Coast, Frylock, Master Shake, and Meatwad have proven incredibly resilient agents of animated chaos. Kevin McFarland checks in on the Aqua Teens’ latest iteration, retitled to acknowledge that no one’s watching for the series’ well-defined mythology. The Circus (TCM, 8 p.m.): Charlie Chaplin’s Little Tramp stumbled into so many odd jobs over the course of his silent-film reign, he was bound to cause comic mischief under the big top at some point. Here he’s the unknowing star of the three rings—and a pretty decent tightrope walker, to boot. MLB Baseball: Yankees at Mets: Now this you can call a Subway Series, pitting the Yankees and Mets in an encore of the 2000 World Series—and a possible preview of the 2012 Fall Classic, assuming the Yankees can stay on top of the American League East, the Mets can claw past the Nationals, and nothing else changes in the standings through the end of the season. Tall Hot Blonde (Saturday): Garret Dillahunt returns to his “unhinged killer” roots in this torn-from-the-headlines Lifetime movie (directed by Courteney Cox!) that forever altered Phil Dyess-Nugent’s impression of that Raising Hope episode where Burt learns to use a computer.